Most of the storage-tank water heaters are basically steel cylinders that have a cold water inlet pipe, which brings the cold water in. The water then gets heated inside the tank and is then carried out through the hot water pipe. Another pipe that protrudes out of the tank has the temperature and pressure relied valve, which opens in case either of them exceed the preset level. On top of that, you will also find a drain valve that is located near the bottom of the tank, and a control unit which is located on the tank to control the temperature of the water. In gas models, there is an option for controlling the pilot light. Gas is the fuel of choice if you already have natural-gas service or can run a gas line to your home economically. Gas models cost more than electrics. But on the basis of national-average fuel costs, a gas water heater will cost you about half as much to run as a comparable electric model. Thus, a gas heater might amortize the up-front difference in cost in as little as a year. While you'll also find oil-fired storage heaters, they're relatively expensive, because they include the tank and an oil burner. That's why homes with oil heat typically use an electric water heater. 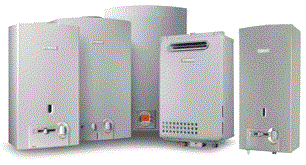 -Most of the storage water heaters will provide hot water heater as soon as you open the faucet. Instant hot water heaters, also known as tankless water heaters are usually the size of a suitcase. They heat water on demand, whenever needed, using an electric coil or natural gas. The water passes through the heat exchanger inside and gets heated using the heating apparatus. Hence, as a result, they eliminate the risk of tank failure and also cut down on energy lost which would happen due to reheating of the water, as done in storage-tank hot water heaters. What's more, they're expensive to buy and install, and include limitations on hot-water flow rates, a possible issue in large households. And cooler incoming water in winter typically means your hot water may not be as hot as you like. 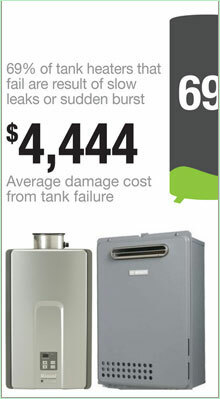 -Nothing beats a tankless heater for putting out lots of hot water—it never runs out. -A tankless heater saves about 30 to 50 percent in energy costs over a conventional gas heater (minimum EF of .82 vs. .54 for conventional). -A tankless heater usually a size of a suitcase, hence it can be virtually installed anywhere and won’t take up a lot of your valuable space. -With tankless heaters, there's a lag time of three to eight seconds to fire up the burners and heat the water to the set temperature. -Installation can be a major project. 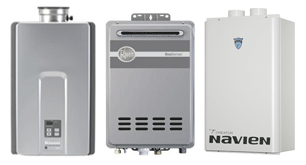 -Tankless heaters must be flushed annually with special chemicals to remove scale and maintain energy efficiency. You can easily do it yourself or hire a plumber (about $125).